Welcome to another installment of If My Book, the Monkeybicycle feature in which authors shed light on their recently released books by comparing them to weird things. 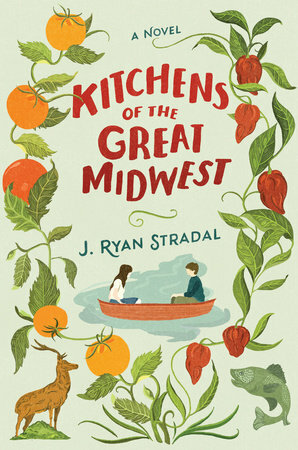 This week J. Ryan Stradal writes about his debut novel, Kitchens of the Great Midwest, just published by Viking. If Kitchens of the Great Midwest were an extinct reptile, it would be a champsosaur, a gavial-like aquatic predator of the order Choristodera. The reason why is a slightly sad story, like how missing the bus in winter is sad. As a boy growing up in Minnesota, I loved dinosaurs, like a lot of kids everywhere. I spent most of second grade creating an elaborate map of dinosaur discoveries in North America and held lectures, one for my elementary school class, one for the entire elementary school, and one at the senior high school. I tried my best to be amusing and informative, and people seemed to admire how I had cut and pasted dinosaurs over the exact locations where their remains were discovered. I took pride in being able to explain them all. Still, there was one aspect to this presentation that bothered me. I had put a dinosaur, a hadrosaur, over a section of my home state. It was, to paraphrase Jeff Tweedy, a case of my lies being wishes. At that point in time, no dinosaurs of any kind had yet been discovered in what is now Minnesota. Most of the upper Midwest was under a big lake for much of the Mesozoic Era, and the displays at Minneapolis’ Science Museum reflected the region’s paucity of terrible lizards; what we had instead, in great number, were aquatic creatures—including lots of champsosaurs. It was brutal to reconcile my dreams of being a paleontologist with a homeland that completely lacked the specific object of my adoration. Despite their reptilian status and promising Greek suffix, champsosaurs were not and are not considered dinosaurs, which totally sucked for them and for me. However, instead of continuing to gerrymander the Judith River Formation, I chose to stop using my safety scissors and glue sticks to change the past, and love these non-dinosaur gavial-like things that my home state stuck me with. Once I did, I found that there was actually much to love. Like rhubarb pie, choristoderes kept showing up again and again, whether you wanted them or not; they went extinct and re-evolved several times, from the Triassic into the Cenozoic, with the champsosaur iteration being among the last and hardiest. Is this more beautiful than the saber-toothed cat evolving and going extinct and then re-evolving five more times? Yes, because champsosaurs were one of the unfathomably small minority of living beings to survive the K-Pg extinction event, which you go ahead and try to do, saber-teeth or no. Although choristoderes did not figure as significantly in my book as they do in Minnesota’s fossil record, Kitchens of the Great Midwest is, above all things, a sincere love letter to my home region, a celebration of its inherent qualities and commodities, and an embrace of everything I experienced growing up that I hadn’t really seen dramatized in fiction. It’s about a young woman who doesn’t have to go far from home or change much about herself to be an incredible success, and it’s populated with characters who are like champsosaurs in their ability to evolve, thrive, and subtly impress. Let other states have the Tyrannosaurus Rex and the velociraptors; my home state, and my novel, are about unlikely survivors. J. Ryan Stradal is the author of Kitchens of the Great Midwest (Viking, 2015), and lives in Los Angeles, where he is the Acquisitions Editor at Unnamed Press, Fiction Editor at The Nervous Breakdown, Advisory Board member at 826LA, and co-producer & host of the literary/culinary series Hot Dish.